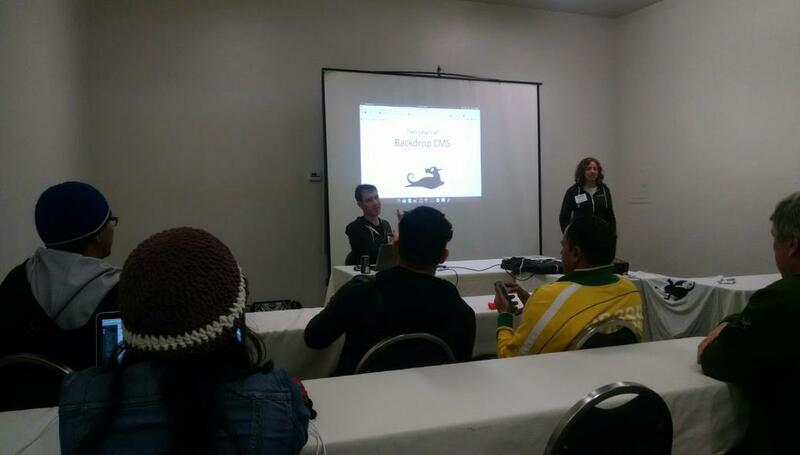 My second trip of 2017 was my first Drupal event of the year and my first speaking sessions of the year for San Diego for SANDCamp. 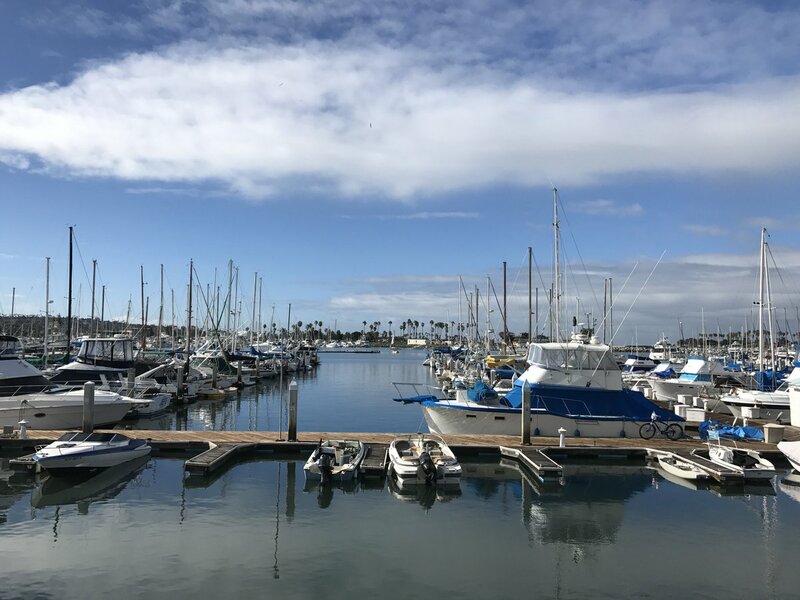 Held in the very beautiful Marina Village right on the water, we had a pretty amazing backdrop for 3 days of learning and sharing. Thursday was training days and I didn’t get to go to those. 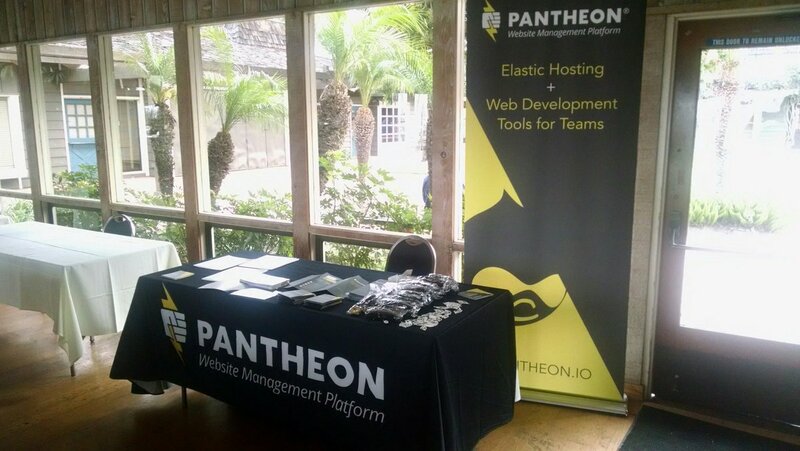 Pantheon was having a function with about 100 of us in the SF office at once. The company is about 45% distributed so this was a very big deal for us all. I stayed with my co-workers for as long as I could, but got to San Diego in time to set up our booth and be ready to go Friday morning. Friday morning brought with it many breakfast choices. There were awesome doughnuts from my fellow sponsors Sagetree Solutions and Achieve Internet. SANDCamp provided warm bagel sandwiches and plenty of regular bagels with accoutrements. Coffee came by way of San Diego’s own award winning Dark Horse Coffee Roasters. Some of the best cold brew iced coffee I have ever had. Lunch was the standard fare box lunch sandwich, chips, cookies and fruit with some pizzas ordered to cover any gaps. SANDCamp stands out to me not for the food itself but the fact we all sat together in one room and the Keynotes were delivered for us while we ate our lunch. More on those amazing sessions later. Friday evening we had catered food truck tacos and nachos served with plenty of local beers and wines. Many awesome conversations and it was pretty convenient to just go from the last session of the day straight to hanging out and pouring a drink. This was super nice because it was pouring rain outside with some very fierce winds pounding down on us. Many locals and the news told me this was the worst storm in many years. Staying dry and eating tacos was pretty awesome. Breakfast and lunch on Saturday copied the previous day but the after party most certainly did not. We were hosted at the pretty hip and hopping Wonderland Ocean Pub. The place was very lively, as we were not the only people who wanted to party after their weekend event. A large Rugby tournament was happening simultaneous to SANDCamp and we shared the bar. While it make it noisy and a tad crowded, we got reasonable service and many awesome drink tokens. When I come back to San Diego I am for sure returning here to get more of the coconut calamari. It was a fantastic way to cap a great event. Unfortunately, due to time constraints I was not able to see as many of the talks as I would have liked. But the ones I did see were great! Here is my wrap up of the ones that stood out from the ones I saw. Jen Lampton and Nate Haug gave a couple talks but I was only able to attend one, their two year retrospective of BackDrop CMS. I have heard a variation of this talk before, but as more of a general ‘Why Backdrop’ discussion, which had inspired me to experiment with this Open Source fork of Drupal. It is exciting to see how far the project has come and I was surprised by the number of contributors they reported. I also learned that contributing has some very nice benefits, they would be happy to tell you more. Very well done and the fact that Jen and Nate are two of the nicest people in the world made this a good time. Robert Manigold’s session really had two key takeaways from me. I learned a very sharp and succinct reply to the reaction ‘that seems expensive. That reply is “Expensive to who?”. I have not heard this before but I will be using this moving forward. It immediately changes the conversation from one about a price point to one of worldview and if this product is even the right fit for them. The other major take away is the claim that only four (4) pricing strategies make a profit: Luxury, Premium, Low Cost and Ultra Low Cost. Robert explained that everything in between will self select out and end up with friction with mismatched customers in the process. This seems like a bold statement to me, but the further I think about it the more correct this seems. When confronted with ‘there needs to be a price in between’ I am going to start exploring which bucket the client really wants to be in and how we can help accommodate that to make everyone happier. There are so many places where communication can get disrupted or poorly transmitted it is almost absurd we communicate as well as we do. This talk was fantastic in revealing that not only must we strive for clearer expression of our ideas but we must also follow through to confirm that delivery, and maybe more importantly, comprehension has occurred. The Q&A had many insights from the crowd and was one of my favorite exampled of how we can learn from each other at these sessions. I gave the Storytelling talk first and to a full room which really helped the energy of my talk. 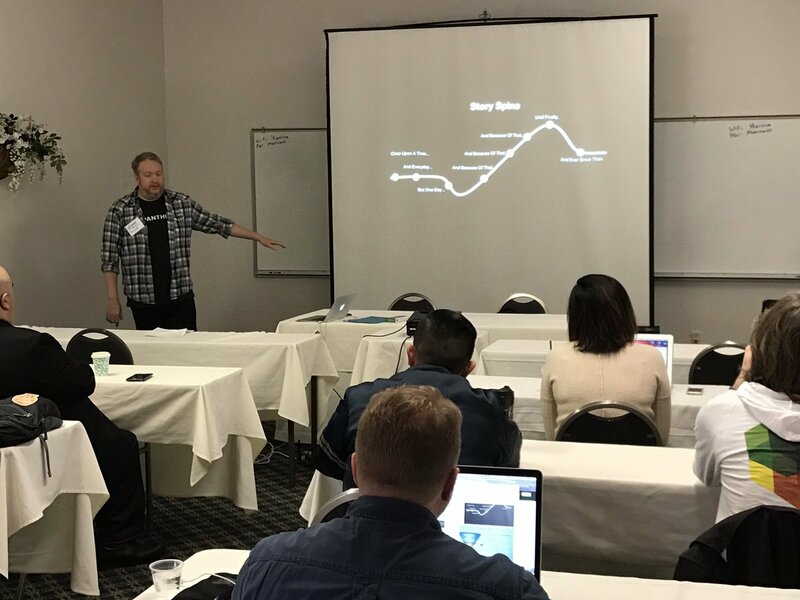 There is a tremendous power to leveraging The Story Spine, defined by Kenn Adams, to translate any client or other request into a cohesive narrative. We think in stories and being able to help other people realize their thoughts in a more articulate and prescribed fashion is key to meeting their needs with great results. You can find my slides here I was really grateful for the feedback and there is a bit of tuning and tweaking to do but based on the reception here I really look forward to given this talk again. The pricing talk (slides here) is the one that is specifically targeted to the exact audience of freelancers and new agencies that are just starting to grow. Having established business owners in the room and some non-business side folks led to some interesting discussions. 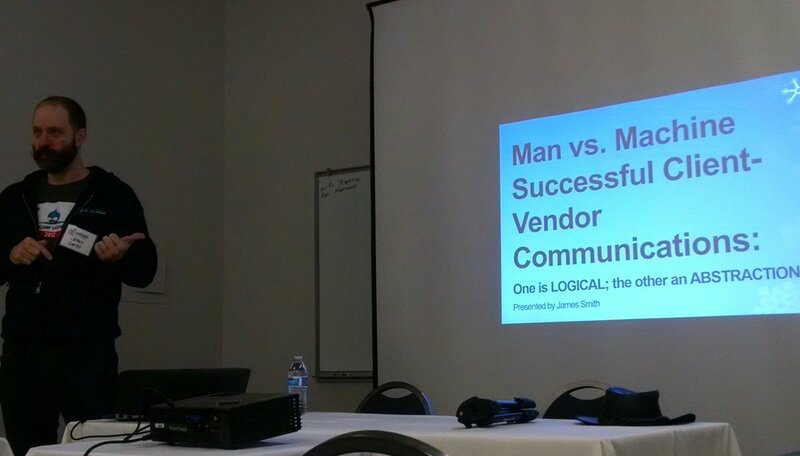 My biggest take away on this talk was I need to tighten it up to leave more room for discussion. Coming right after a keynote that sparked a lively discussion on the identity and marketing of Drupal, there was a palpable sense of conversation in the Q&A where we were really learning from each other. While it was pretty rad to give three talks, they were all scheduled for Saturday. I can safely say that giving multiple talks in a single day is exhausting and might have affected quality of delivery by the end. I think if I face this situation again in the future I will ask for some additional spacing between talks. Still very grateful to have the opportunity to contribute to the conversations. 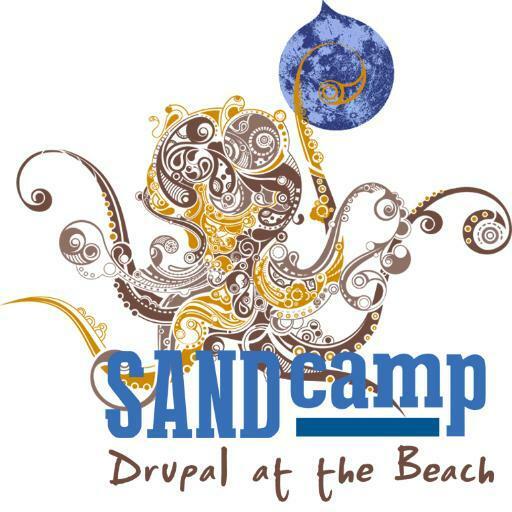 There were two keynotes at SANDCamp. As I mentioned before these were delivered while all the attendees ate lunch in the same place, at the same time. This created a super connected feeling among the attendees, sharing the larger discussions that spawned from these topics. 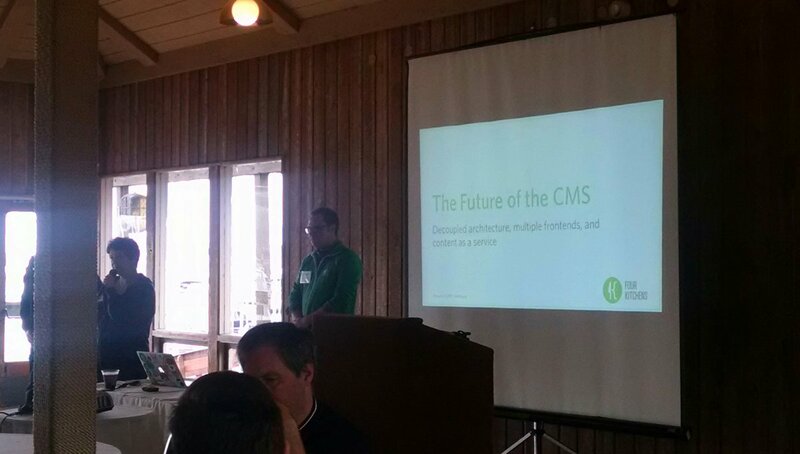 Friday Todd Ross Nienkerk, CEO and co-founder of Four Kitchens talked about the Future of the CMS. I felt he gave a pretty good summary of why we need to think in decoupled architectures for better client experience. I have heard multiple talks about this subject from a wide range of speaker but the thoughtfulness of Todd’s comments and slides really made this sink in for a few of the folks I spoke with. Making this even more remarkable was Todd stepped up literally at the last minute to do this talk as a replacement for Darin Andersen, who’s fight was cancelled due to the unusual weather conditions. I am sure his talk would have been awesome as well, but Todd’s was outstanding. 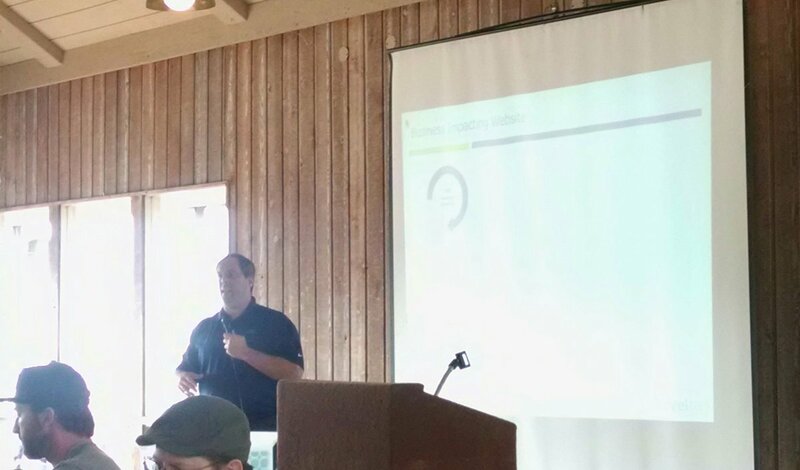 Saturday we got to hear our regularly scheduled speaker Tom McCracken from LevelTen give the highlights and insights he garnered from the great 2016 LevelTen Roadshow. His slides and comments reminded me much of my own journeys around this country and all the great communities I have had the pleasure of participating in. Tom shared his observations that indeed there is much to learn from other communities such as WordPress; a sentiment shared by a growing number of thought leaders, echoed by the likes of Josh Koenig just a week prior at LoopConf. The Q&A session of Tom’s talk turned into lively discussion on the future of Drupal itself. There are very few moments I can point to where a group that large was fully engaged in such an open, honest and thoughtful discussion. This topic was on everyone’s tongue for the rest of the day and well into the awesome party. There are no easy answers to what we need to do as an industry next, but if we can keep sharing our experiences and thoughts in such a civilized discourse, I for one think that the future looks fairly bright. Aside from arriving for The-Storm-Of-The-Century-So-Far I also just happened to be in San Diego for the San Diego Improv Festival. 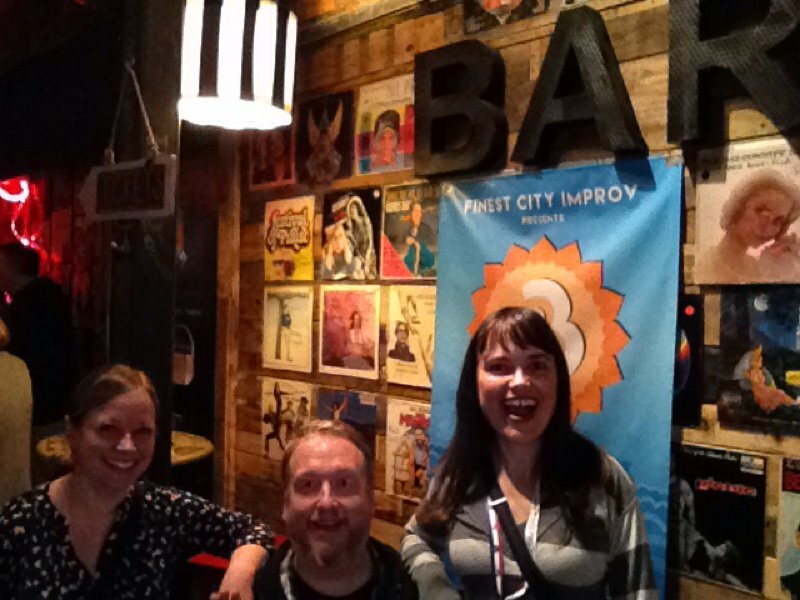 Dozens of my awesome improvisor friends from all over the country were in town doing that art form I love so much. 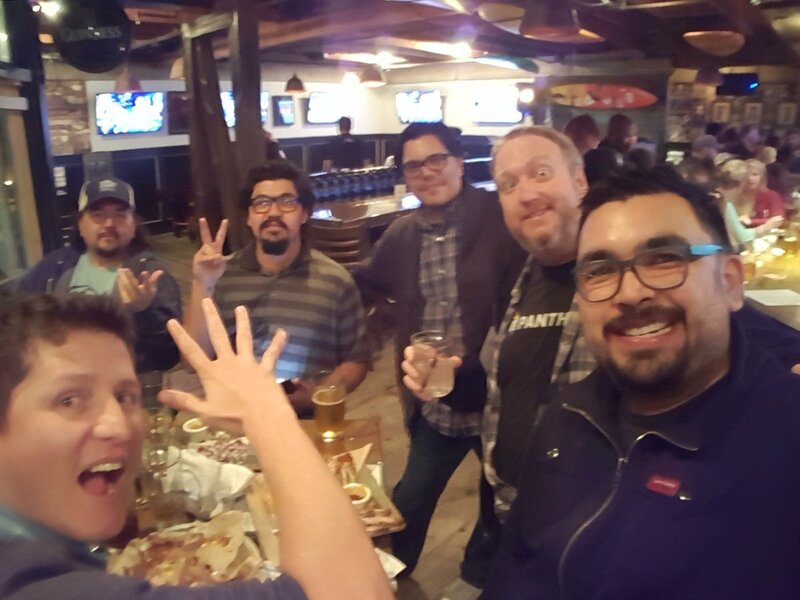 I had the extreme pleasure of getting to hang out with my people from Michigan, Utah, San Francisco, LA, Riverside and of course SD’s Finest City Improv. I unfortunately didn’t get to see an actual improv show though since it was completely sold out, but with all the bits (which is all improvisors do) it felt like I was just part of one massive show. This was the 4th time in my life my work travel just so happened to coincide with an improv festival, joining Sarasota, LA and Minneapolis. It makes all the travel that much better since it feels like I have family all over the place. SANDCamp was a blast and I am very glad I got to visit San Diego. I am pretty sure it is an awesome city, but I didn’t get to go see too much of it this time around thanks to the rain and my time limitations. What I did get to see was pretty awesome. I feel very fortunate to have seen the sessions I did and got to be part of the larger conversation that really solidified around Saturday’s keynote. The future of Drupal is not set in stone but we pretty much all agreed that this community and what we have accomplished so far is pretty special and awesome.